It's time for the New Product Launch! All the Stamps, Die-namics, and Stencils can be found HERE. Please remember to visit each of the MFT Designers' June New Product Launch posts on the MFT Blog and leave a comment by the end of the day on Thursday, June 4 for your chance to WIN one of two, $100 Gift Vouchers. Ready? Set. Comment! I hope you have all enjoyed all of the products being debuted this past week. I have a long list of favourites from this release! 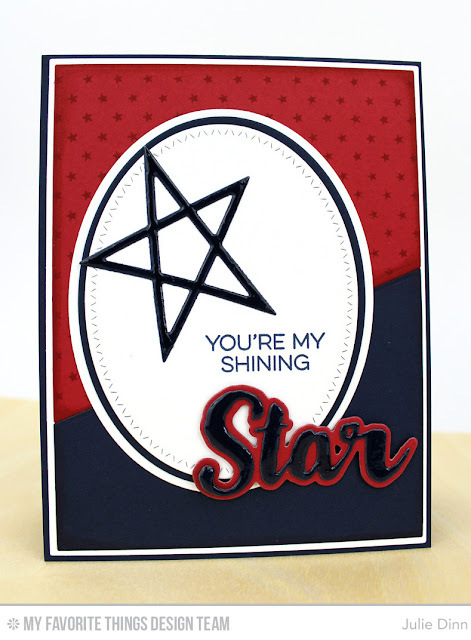 My cards today feature a few of my favourite new products, the Zig Zag Stitched Oval STAX Die-namics, Count the Stars stamp set and Die-namics, Lucky Stars Die-namics, and Stars & Wishes Die-namics. One of my favourite things about all of the stitched dies is the subtle detail they offer, the new Zig Zag Stitched Oval STAX is a perfect example. The stitched add just the right amount of detail without over powering the rest of the card. Here I paired it with the new series from Laina Lamb and the Tiny Stars Background. I love all the different sentiments in the Count the Stars stamp set. It is so easy to mix and match them to create new greetings for each card. Once again, I paired the new Laina Lamb stamps and dies with the Tiny Stars Background and the Zig Zag Stitched Oval STAX Die-namics. For my final card, I went for more of a rustic look, switching out the white card stock for Kraft. I added an extra shadow to the wish sentiment by slightly offsetting the Wild Cherry die-cut. To create the background I stamped three Vertical Stitched Strips with the Linen Background. I'm with you Julie, I love everyone of the star products this month. These cards are great. love how you used the star stamps and dies. totally on my wish list. Wonderfully crafted cards--love the tiny star background! An awesome trio of cards! Love the pops of colors! Cute cards. I love that you made three cards for us using the same tools to get the wheels turning. Thanks for sharing. I agree, the subtle detail of the zig zag stitches is perfect! i love this release, the star and big wish is awesome, great cards. Those stamps and dies make such great cards! Love the tiny star background! The stars and large sentiments are wonderful! Great cards! I really like these cards! Great cards! Bright and graphic! So pretty! That wish really pops! Not only one, but 3 prety cards with lovely stars. I love it! Such lovely cards. Thank you for sharing. Love all your star cards! The color combo's on each of them rocks!! I love how versatile the star background stamp is. So many creative ways to use it and I especially like the tone on tone red background you created. Love the triple shadow on 1 of the sentiments and the different size star die cuts are the perfect touch! Love the subtle shading of the die cut shape as well. Thanks for sharing your wonderful ideas! Great cards. I really like the first with the gorgeous blues the best. 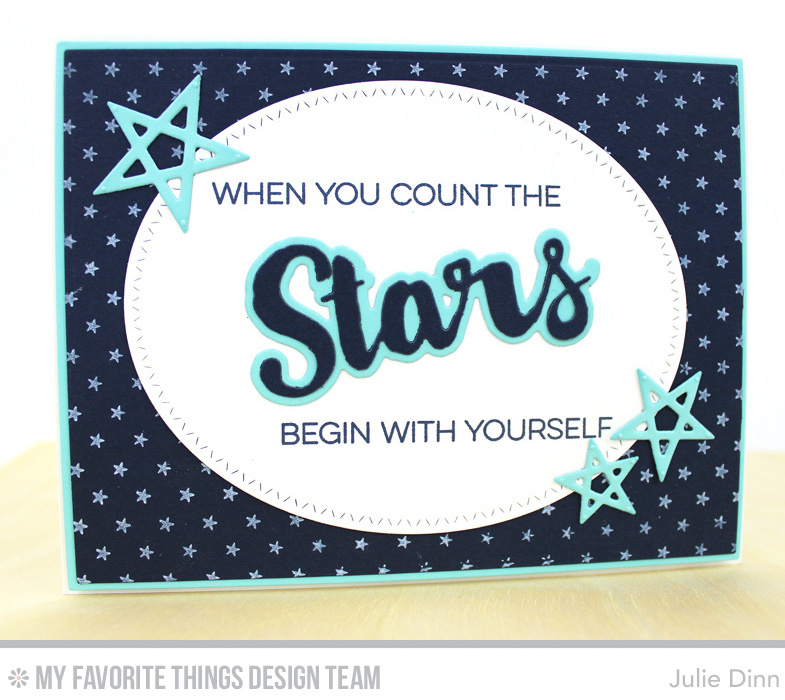 I love that star background and all the great sentiments in the count the stars stamp set. Super Cool and cute cards!! These are gorgeous! I love the stars in this release. Really great cards. Perfect for boys. So many great ideas for using that stamp set. Beautiful cards. Love the blue star card. I love your take on using the die-cut sentiments and wording on your cards. These are Awesome!!! What a great set of masculine cards! Love the count your stars sentiments. Nice cards! Great cards! I love the colors you selected. Thanks for sharing! I love the combo of the bright turquoise and navy! Beautiful cards! I love how you showed the versatility of the these stamps and dies. Stars are so classic, and yet, these new dies add a modern twist. Great bunch of cards; they are perfect for anyone! Love all of the new star products! Great cards! Great cards, I love the stars and the sentiments. Great trio of cards! The stars are so fun! Beautiful cards. I love the sentiment to count yourself in the stars. Great cards! Love those stars!! Love those stars and the font on the stamp/dies! Great cards! Am I the only one who hears Prince with all these star sentiments? lol Great cards! Great cards. Love those stars. This is my favorite shape. Cute card! I am really loving these stars! These star themed products totally rock! Great variety of star cards. Love both cards. They could be used for men or women and so many different occasions. Julie the oval paired with the big sentiments is fantastic! I love ALL the Star items in this release! Your cards are so, so nice! Great examples using the star MFT products. Great set of cards Julie. So many options with this set. Great ideas! Cards with Simple lines! Loved it! Very nice cards - love their simplicity. I also love the new products this time!!! I just love stars and these are all gorgeous!!! Simple yet bold! Great set of cards! Oh my your cards are wonderful. Love them. Thanks for sharing. Great sentiment. The cards are suitable for both genders. Well done. Fabulous cards! Loving these new products! Terrific cards! Great color combinations for each of them too! Awesome cards!! These are perfect masculine cards. Great color choices. Definitely need to add the lucky stars dies to my collection. Stars can be used for so many occasions. Thanks for this fab release. Such great cards. Some of my favorite products from this release. How did I go this long without realizing I need to own oval dies? I'm really loving all of the star-themed stamps from this release!! Anything with stars is a winner in my book! love the rustic look of the third card. Love how you made the sentiment the star. Such perfect CAS cards! Love the bold colors! I do like those zig zag oval die cuts too. I love the font of the stars and wishes set, and the way you made your cards caused them to look even better. Love these all but I think the third one is my favorite...that kraft with the light blue is lovely and especially using the stamped background.